While Bell & Ross‘ signature BR 01 series of watches are aviation-inspired, the most striking have gone beyond the cockpit, into the world of buccaneers and pirates. And it’s worth noting that B&R got there before skull watches became a thing, introducing its first almost a decade ago in 2009. 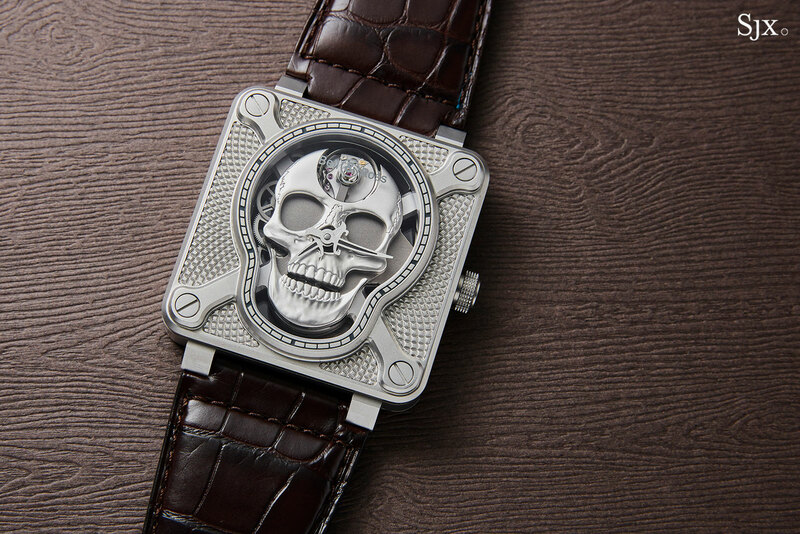 Its skull watches drew on the Jolly Roger – which has also been used as an emblem of airborne military units – with a skull-shaped dial and bezel set against the famous square watch case. 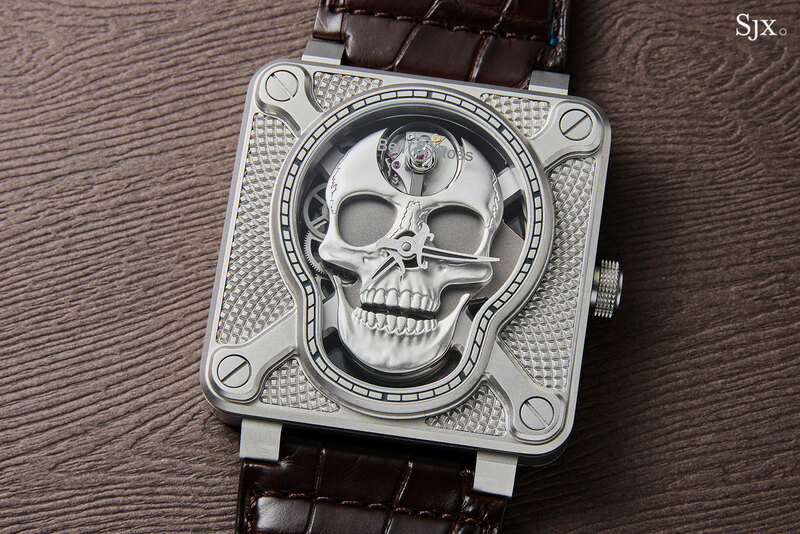 The idea has since spawned multiple iterations including a bejeweled skull, a tourbillon, one in aged bronze as well as an engraved version. Now B&R has gone one up with the BR 01 Laughing Skull that incorporates a simple automaton, and boasts an in-house calibre. 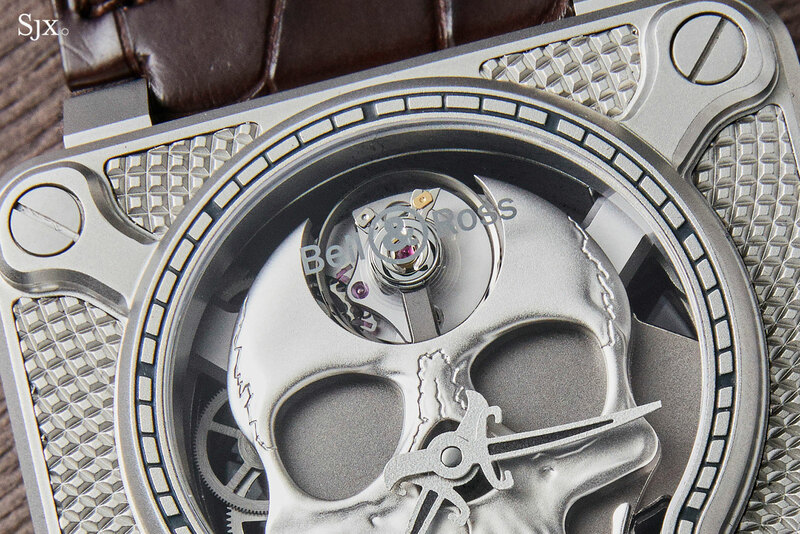 While earlier skull watches were powered by ETA movements, the Laughing Skull houses a hand-wound, form movement developed by B&R. 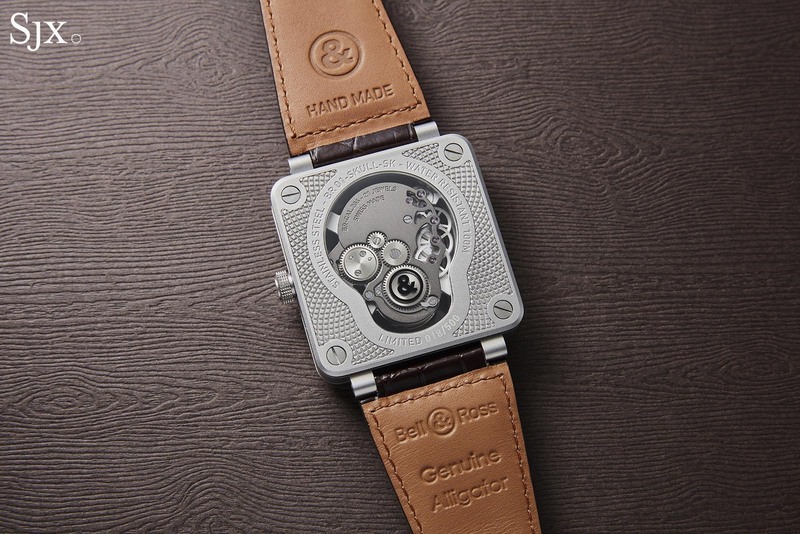 In fact it’s the brand’s first in-house movement, christened the BR-CAL.206. 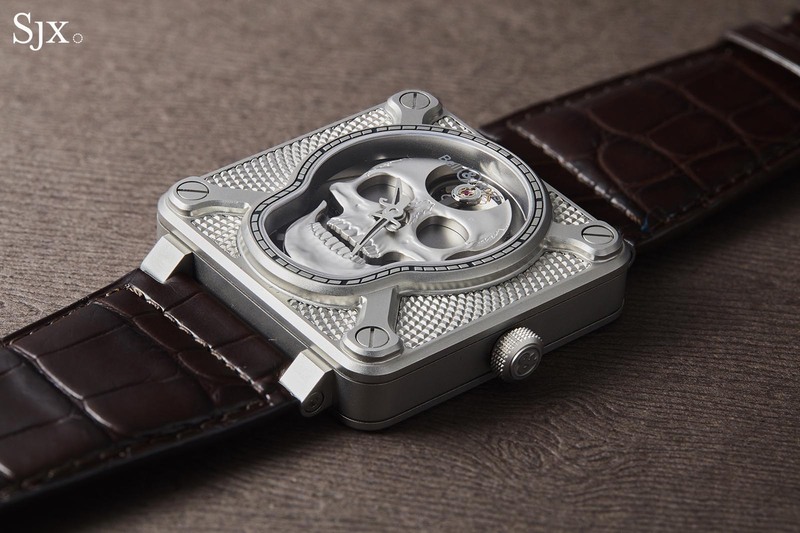 The base plate of the movement is shaped like a skull, with the gear train running down the side of its face and the balance wheel visible through a cut-out on the dial at 12 o’clock. The barrel sits just behind the teeth of the skull. 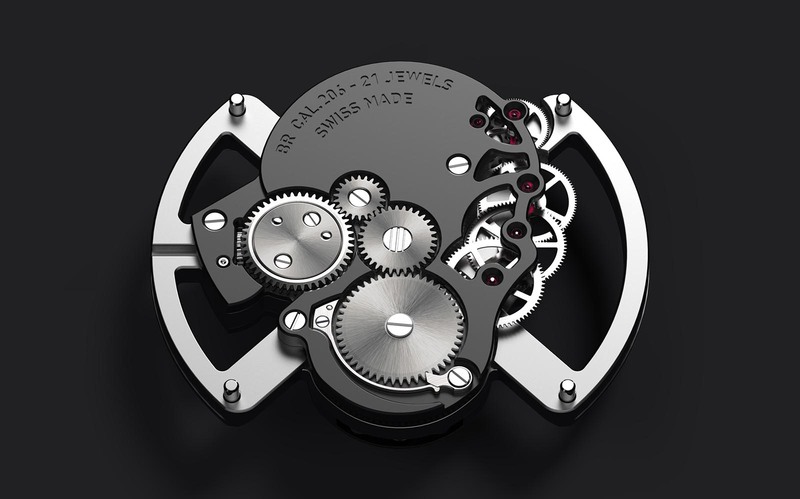 The movement is secured to the case by two bridges that merge into the crossbones-shaped bezel. The face of the skull is an appliqué, which has been stamped to render it in relief. A circle opening in its forehead reveals the beating balance wheel. Unlike the brand’s earlier skull watches, the dagger and sword-shaped hands – which are oddly mounted on the nasal cavity – have been skeletonised and filled with black Super-Luminova (that glows in the dark but not as brightly as green or white lume). 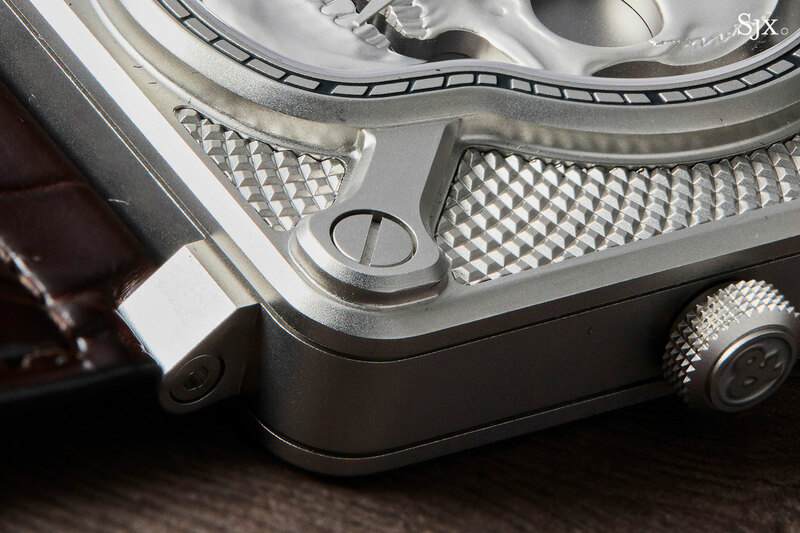 The 46mm case of the watch is forged from micro-blasted steel and is decorated with a clous de Paris, or hobnail, guilloche, offering a pleasing contrast to the skull rendered in relief. 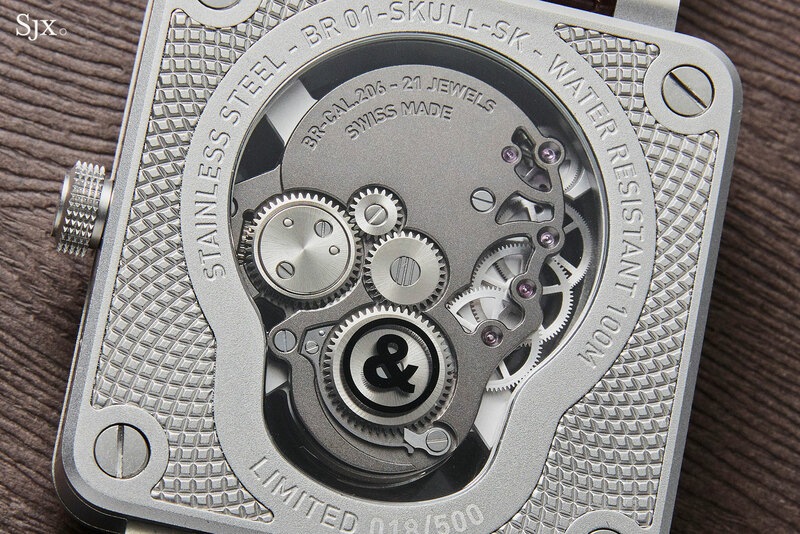 The back of the watch reveals the form movement through a sapphire window, with the B&R logo print on the underside of the sapphire just above the barrel. 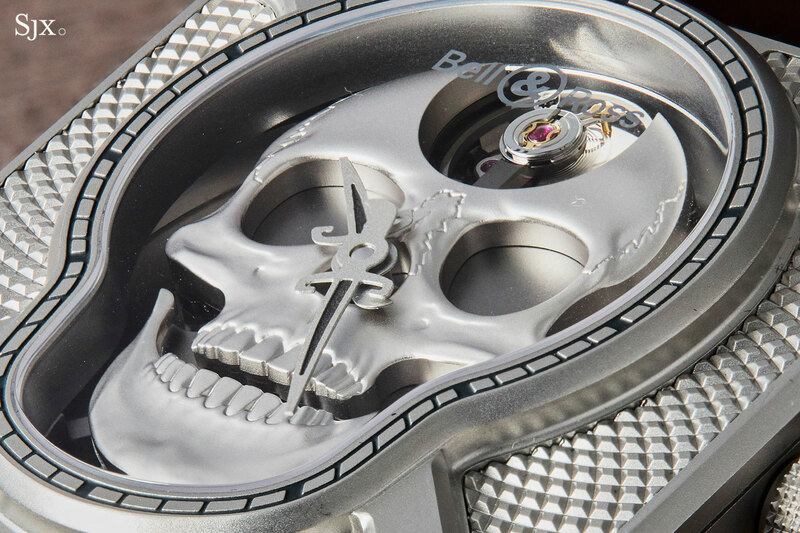 The BR 01 Laughing Skull is limited to 500 pieces and is priced at US$9900 or S$14,900. For more information, visit bellross.com.